AC Log 5.5, Contesting Program Updates, JTAlert Now Interfaces via API & More! I hope that you are doing well! Software development has been on a roll at N3FJP Software headquarters this spring! Amateur Contact Log 5.5 is Now Available! - DX Spots where the entity is needed AND the spot is an LoTW user (use the ID LoTW Users button on the LoTW set up form to enable) is displayed in Red italics. In this example, E44YL, Palestine, is not confirmed on 40 CW in my log, she is not listed as an LoTW user, so her spot is italic. 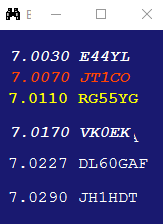 JT1CO, Mongolia is not confirmed on 40 CW in my log, he is included in the LoTW user list, so that spot will appear in red italic for the duration that it is displayed. The new color and font coding makes it very easy to look at the band map at a glance and see which stations are needed for your DX awards goals! Please visit here for all the details on setting up DX Spotting. As always, upgrades are free to registered users. You can download Amateur Contact Log 5.5 from this page. If you are running AC Log 4.0 or later, don't forget to uninstall your previous version from Windows Control Panel first! Complete upgrade steps for Amateur Contact Log are here. New Versions of All Contest Programs are Now Available! - DX Spots where the entity is a needed multiplier are displayed in italics (in programs where applicable - not in state QSO party programs). - Press Ctrl + Shift + S for programs to read the next serial number (for blind hams in programs where applicable). Some of these enhancements were in the previous release of the major contest programs, but now they have been integrated into the rest as applicable. As always, these upgrades are free to registered users! JTAlert Now Interfaces with N3FJP Software! Laurie, VK3AMA has released a new version of his JTAlert, which interfaces directly with Amateur Contact Log via my new API! You'll find JTAlert here. I underestimated the demand for ACLog support, given the large number of people who responded to my request for ACLog / JTAlert testers, otherwise I would have coded the support before now. Thanks everyone who wrote Laurie and your interest in participating in his beta! Field Day is Coming - Check Software Installation Off the List! Field Day is just 9 weeks away! With all the other preparations on your "to do" list, now is a great time to check off the Field Day software installation. Have everyone bringing PCs install the latest version of the Field Day software. If you are planning to network (highly recommended), get the PCs together in advance to make sure you have the network set up properly as detailed here.